The names of these men will be revered for evermore for their achievement. The years have not diminished it. If anything, time has only served to make the triumph all the more remarkable. I took this photo in March.2007 in the Jock Stein lounge. In an era of the Champions League, when Europe's premier club tournament has been moulded and meddled with to suit the big clubs and, more importantly, the television companies, it's the Spaniards and the Germans, even the English, who now dominate the latter stages of the tournament; and it's not even always the champions of each particular country. 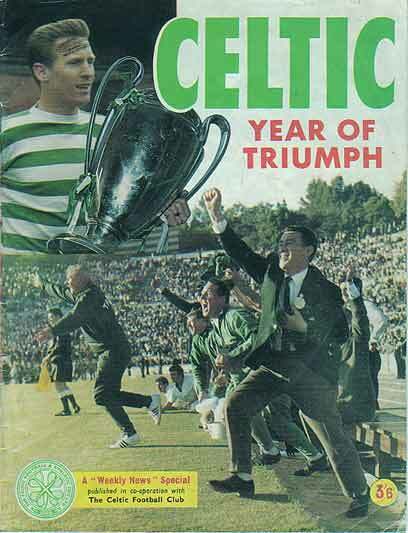 Celtic: Simpson, Craig, Gemmell, Murdoch, McNeill, Clark, Johnstone, Wallace, Chalmers, Auld, Lennox. Inter Milan: Sarti, Burgnich, Facchetti, Bedin, Guarneri, Picchi, Domenghini, Cappellini, Mazzola, Bicicli, Corso.